You find these insects abound in other seasons such as cockroaches, mosquitoes, ants and others ..
And that you should understand the message instead of killing insects that tell you the existence of energy imbalance in your home. Some may ask what it means to have an energy imbalance at home? If your family members have a lot of problems, quarrels, insults, insults or inconsistencies, make sure there is a defect in the energy of the house, or it may be envy or magic. The insects fully know these energies and are attracted to them. 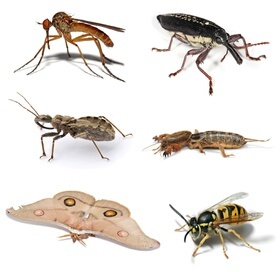 Take the types of insects and why and behind the presence of many at home. @ Cockroaches, jealousy between the house members or from the direction of the rest of individuals. @ Vulgarity or leprosy, abound in houses where insulting, swearing and cursing even if the individual family member. @ Mosquito, abound in homes whose owners are arrogant and arrogant. @ Spiders, may indicate the presence of treasure or money or that a family member keeps a large amount of money, or the existence of energy sheds if the wife dominates the husband. @ Flies, abound in homes whose owners are dissatisfied with their lives and always tense. @ Butterfly, its presence means high-frequency energy is beautiful there is good news or news.